L.A. City Councilmember Mike Bonin addresses the standing room only crowd at last night's Mar Vista Community Council meeting. Photo by Joe Linton/Streetsblog L.A.
Last night a crowd of about 300 people gathered at the Mar Vista Community Council’s meeting where the board took action on the Venice Boulevard Great Streets project. On the council’s agenda were two motions regarding Venice Blvd. The board rejected a motion calling to immediately reverse the Venice lane reduction, and approved a motion that keeps the project intact while calling for data to inform a future assessment. New mid-block crosswalk and parking-protected bike lane on Venice Blvd in Mar Vista. Photo: Joe Linton/Streetsblog L.A. The 0.8-mile Mar Vista Great Streets safety improvements are located on Venice Boulevard from Inglewood Boulevard to Beethoven Street. They opened in late May. The city added new mid-block crosswalks and protected bike lanes, while reducing car traffic from six lanes to four. The safety improvements are part of the mayor’s Great Streets initiative, and respond to excessive levels of traffic deaths and serious injuries. This stretch of Venice Boulevard is identified as a priority corridor on the L.A.’s Vision Zero High Injury Network. Both project supporters and opponents had organized to turn out their sides for extensive public comment. Project supporters applauded frequently when speakers expressed pro-livability statements. Project opponents applauded their side’s statements, while also frequently shouting, booing, and hissing to interrupt project proponents. Frequent opponent outbursts included “change it back!”, “restore Venice!”, and “recall!”. Bonin acknowledged that project feedback has been mixed across numerous constituencies. He stated that he has heard from car commuters who report significant delays while others report it has not impacted them. Bonin stated that he has received positive and negative responses from businesses, cyclists, and seniors. He emphasized that he was there to listen, and that he will use feedback and data to evaluate to make changes as needed. Bonin’s remarks were followed by a presentation by L.A. City Department of Transportation (LADOT) Vision Zero lead Nat Gale. Gale emphasized the project’s nearly three-year-long community outreach process, Vision Zero, and LADOT’s commitment to monitor and make adjustments. The Mar Vista Community Council board initially appeared somewhat split. Some boardmembers expressed frustration with the project, especially citing business opposition and emergency responder access. Other boardmembers expressed frustration with “disgusting” project opponent behavior, especially jeers and laughter directed at Streets Are For Everyone founder Damian Kevitt who lost a leg to a hit-and-run driver. MVCC’s vote echoes a similar approval by a Venice Neighborhood Council committee last week. Overall, the council’s affirmation of the project, the large mobilization of livability advocates, LADOT’s implementation of key facilities to advance Vision Zero, and the continuing leadership of Councilmember Bonin, all point to last night’s vote as an important victory. The city can implement excellent courageous projects that prioritize safety while balancing the needs of all road users. These projects can save lives. Bonin and LADOT will be hosting an upcoming open house to share data and gather further input on the Venice Blvd Great Streets project. The next open house will take place on Saturday July 22 from 1 to 3 p.m. at the Windward School gym at 11350 Palms Boulevard in Mar Vista. I was nearly hit on my bike by a speeding car making a right turn here this morning. Clearly he should have been paying more attention, but with the old setup I’m guessing he would have seen me. Not the first near accident I’ve had with cars/pedestrians in these protected bike lanes. Any other cyclists skeptical of their safety? I find it difficult to believe that parking protected lanes, which have been proven to be safer in so many other jurisdictions, are somehow less safe here. Are LA drivers that much less attentive? Do they have a smaller range of motion when turning their heads? Or are they, as you say, *speeding* when they should be *slowing*? Seems like driver behavior is a HUGE factor in whether a corridor is safe or not. Perhaps driver education is in order? Turning actions are always problematic, and the idea with a protected lane like this one is that car drivers are able to make a complete turn before they enter the bike lane, as opposed to what they were before, where a driver starts their turn into the lane. It’s a different kind of turning action, and it does mean having to think differently about what is on the street, but it’s actually a much safer action, since a bicyclist is generally much more likely to be in the range of vision of a driver before the driver crosses through the bike lane. The best thing that LADOT could do at this time to address that would be to put down some green stripes for the bike lane as it crosses the intersection so that drivers are more cognizant of the need to be alert for the possibility of people in the bike lane. You know what else is in order? Pedestrian education. Whenever I’m walking I pretend I’m the prey. It’s done wonders to keep me alive. There is also the danger that cyclists will think they’re protected when they aren’t. This doesn’t eliminate the interfaces, it just moves them. Many drivers are unable to move into the gutter lane no matter where it is, and still pull left on their way to right. I don’t really understand how this really helps cyclists. It spans less than a mile, then what? Is it the idea that this is supposed to be the start of something bigger? What about using part of the sidewalk area as a dedicated bike area (assuming re curbing or paving is a possibility). Then there could be a protected bike lane and the original car lanes, but a narrower sidewalk? If there’s going to be real progress for cyclists there needs to be a route from coast to downtown, not just a few blocks. Maybe something along the light rail routes? I know it would involve a real investment but these .8 mile bottlenecks just pit drivers against cyclists so another politician can put a feather in his cap. 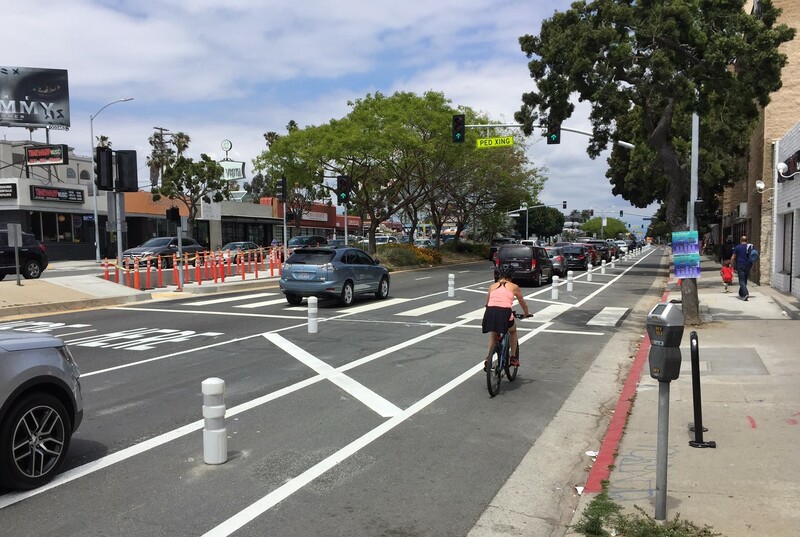 There are regular bike lanes to the east and west of Mar Vista, but the parking protected bike lane is supposed to help protect cyclists while not taking away parking for merchants. During peak hours, the parking lane should be a bus lane, since buses have to go off to the curb and wait before pulling back in. Unfortunately many Great Streets improvements treat transit riders poorly. Ideally they should do one of the floating bus stop islands like on Los Angeles Street next to City Hall (where the bus stops in the road and bikes pass to the right of the waiting passengers), although I’ve heard that advocates for the blind don’t like that since they step off and are either confronted by an unexpected curb or power bicyclists zooming by at 15-20 mph who yell at them for walking into their path (although a cyclist can stop much, much easier than an equivalent car can). Also concentrates them at a single point instead of an infinite number of points between them. So is there a new Bike Use Tax supporting all this spending? Are bike sales exempt from Measure M? This is cheap, and reduces the long term liability of oversized streets. Bikes don’t cause potholes. I’m so glad to hear about this result. I don’t live in the area so I don’t post any comments on local blogs, but the hyperbole and red herrings being deployed project opponents drives me crazy. Especially annoying are all the people who say that the big bad bike lobby is being “Trumpian” and ignoring the common man residents. All the lane reduction is doing is pushing traffic off Venice (where it belongs) on to residential side streets (where it doesn’t belong). Many cyclists aren’t even using the new protected lanes and are still riding on the sidewalks. This project is creating more problems than it’s solving. How much do you think paint and some flex posts cost compared to say repaving streets due to wear and tear from motor vehicles? Do you have data to prove this, or is this merely your belief? Do I have before and after official traffic surveys? No. Do I live on those streets and have videos of speeding cut-through drivers? Yes. the anti bike zealots will stop at nothing in their war on cars ! These video examples from a European City ruined by these zealots show where this is headed !!!! Before and after video? I see speeding cut-through drivers on residential streets all through LA, so it’s only really notable if you can show an increase in this behavior on your streets. Sadly, since I didn’t know they were going to restrict Venice, I didn’t have opportunity to take video before. If you talk to the residents, they’re almost universally in agreement on that point. And all of them are just as biased as you. The reality is, even if you’re trying to be neutral, humans are utter trash at estimating anything. Only by actually measuring it can you know anything. I would bet good money that your municipality has actually measured it, and can tell you whether it’s a problem or not. And even if data showed, speeding and cut through traffic is a problem, then the solution is to fix speeding and cut through traffic, not make other roads more dangerous. With you on that! So many times I see these little blotches of infrastructure, then what? You would think at the minimum some signs after the blotch, Careful for Cyclist or something! The bike lane was much safer before the changes. Venice Blvd. was actually a very easy ride. Better than most. Now, cars making right turns are partially blind to bicyclists when parked cars are present. Also, when leaving a business the autos need pull out much further, blocking the entire bike lane in order to get into traffic. This article – and the entire premise of the unsafe streets project – is based on a false argument that the lane reduction is necessary to save lives. There were no excessive levels of traffic deaths and excessive injuries on this stretch of Venice Blvd. There has actually been an increase in car and bike accidents in the past 2 months due solely to the unsafe road design which is confusing and hides bicyclists from auto traffic. Just yesterday there was an accident on Venice @ Wade that was a result of the road configuration. The proponents of the unsafe streets project have yet to show any data that eliminating the 3rd lane of traffic is necessary to keep people safe. The reality is that they don’t care about keeping people safe. This is designed to cause gridlock because they don’t want people driving through their neighborhood. The reality is that cars and bikes should not be sharing the same right of way. They should remove the center median and create a totally separate bike path separated by a cement barrier on one side of Venice. No one wants to make Venice more dangerous. What we do want is for through traffic to be where it belongs, and move smoothly. The problem that most people are skipping over is that bicycle and auto traffic are largely incompatible on the same right-of-way because of the large speed differential. Regardless of how much you “calm” traffic, there will still be that fundamental problem. There are other ways to solve this problem, including making a bike path down the median on a separated grade, and some of those options don’t require removal of badly needed traffic lanes. Look, I’m a motorcycle commuter (I haven’t been to work on 4 wheels since 2009) and I have some of the same complaints as you do: inattentive and aggressive drivers, speeding, etc. The difference is that I have the ability to keep my ΔV with of the rest of traffic low. The huge speed and mass differential makes bicycling inherently dangerous. Let’s not forget that you and I both make the choice to engage in these inherently dangerous activities, and it’s up to us to manage that risk. To me, that’s wearing full gear and avoiding places where accidents are more likely to happen. For instance, I don’t take the freeway to work because the 10E to 405N merge is insanely dangerous. For you, that might be avoiding Venice because riding a bike on a major artery just might be… a bad idea. I understand that many people have a vision of getting people out of their cars – but the reality is that many of us can’t bike for whatever reason (mine is severe arthritis after a service-connected injury) and there is insufficient public transportation available. If I were to use public transport to get to work, it takes about an 1:15. On the motorcycle, it takes 20 minutes. That’s an unacceptable tradeoff, and you won’t see people getting out of their cars until that’s addressed. The solution to the problem has to be one where the needs of everyone are balanced. > There were no excessive levels of traffic deaths and excessive injuries on this stretch of Venice Blvd. “excessive deaths”? “excessive injuries”? “car and bike accidents”? You should read up on Vision Zero, which is based upon the idea that all traffic crashes are preventable (not accidental) with better design, and that deaths and injuries can be eliminated, even if we can’t stop crashes. The nations and cities that have low pedestrian and cyclist fatality rates employ sidewalk and curbside bike lanes with protected intersections. What makes you think that this design won’t work here once people are conditioned to expect cyclists when making turns? Then bring the data instead of your own beliefs…. You cannot backup anything you claim. And as for “everyones needs must be balanced”, you’re right, but the scales have been tilted 100% towards cars for the past 70 years. We must tilt them away from that. Because 100% towards cars is not balance. Arguing to back to the status quo is arguing to tilt back to 100%. Exactly, transit is an after thought and this was an issue I brought up 3 years ago in the LOS to VMT conversation. Now seeing this in practice I am convinced we have screwed bus riders. It doesn’t take a rocket surgeon with data to see that bikes going 15MPH on the same roadway as larger, heavier vehicles going 35 or 40MPH are incompatible. Separating them is a good idea, but they need to be truly separated, but not hidden behind parked cars. That’s a recipe for disaster, and you don’t need data to see that either. If you think my beliefs are clouding my judgment, I have a kettle to introduce you to. As a curiosity, would you support restoring the third travel lane if parking were eliminated instead? Explain to me how you have to be from LA to point out you’ve made claims about things without any data to back it up. Do facts and reality work differently down there? Oh, so you’re here to call names, I see. Well, good day. Doesn’t seem that far from the mark in this case, from reading your other posts. As far as not having any data – since the only thing you will likely accept is government-issued traffic studies, and they don’t exist (which is one of our main complaints), then that is moot. What I do have is over a decade of living in the neighborhood and knowledge of the area, along with posts like the attached. Finally, since the MVCC meeting this article references is for -stakeholders- in the community, that makes any opinion you may have irrelevant, because you live roughly 2,400 miles away from the neighborhood… in a completely different nation. There are still a good number of bicyclists on the sidewalk, too – and that’s not doing cyclists any favors in the eyes of drivers OR pedestrians. That should be a median running Bus only lane to really have high quality BRT like service on the corridor which connects to the Expo Line and at least give transit a chance to succeed as an additional alternative. Not let’s do that TOO, it is not a combo pack! Venice is Highway 187 and needs to go back to the old configuration. I had no problem using the old bike lane. Then a secondary road like Pacific or Victoria needs to be a beautiful bike road because it is a residential street. Road diets make residential streets unsafe as people use them to cut through. This was noted at the LADOT meeting. Drivers are now speeding down Pacific and Charnock trying to avoid Venice. Let’s use some common sense here! Wow, you have learned local opinions on these measures from Honolulu to Albuquerque to Shreveport? That’s a lot of cycling, a lot of local knowledge. Jeff was very clear in explaining the reality that this was an entirely un-warned of happening so residents have no “before” data; we never knew we were having a “before”. After the fact there’s some unknown, unvetted company generating claimed “before” data – but without having known of this proposal or what data was gathered and by whom before any of all this just happened, one does have to wonder about the quality of it. Why are you making so much noise in localities you know nothing of, Mr “Botherston”? bingo. So perfectly articulated; thank you. Ahh, “My town is a special flower like no other, and nothing learned anywhere else applies here” syndrome at it’s best. All I did was suggest that someone have data instead of their own anecdotal single perspective driven beliefs. Whatever man, whining about posts from months ago, you must be be pretty bored. 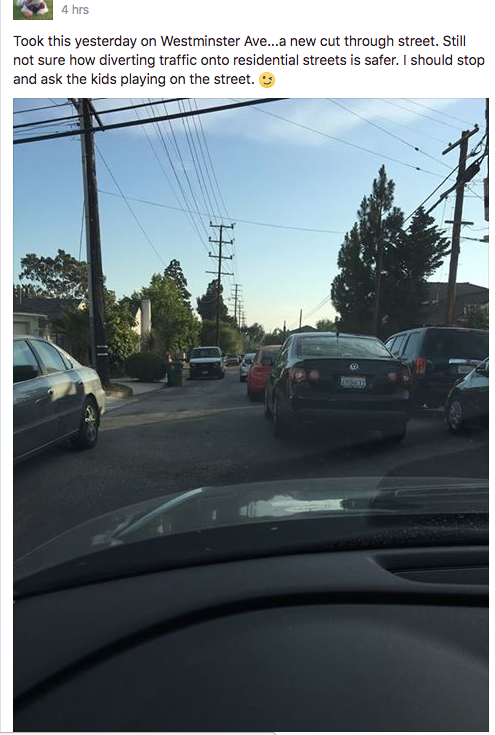 Data still not provided two months after it was requested of LADOT and Councilman Bonin’s office…data that LADOT & Councilman Bonin claim was used to implement such a draconian measure causing gridlock on Venice Blvd forcing overflow into neighborhood streets. MVCCouncil member Rob Kadota is an avid cyclist, offering “Rides with Rob,” and blinded by his passion ignoring pleas of his community to help ease gridlock. Cyclist should be held responsible for their own safety on our streets; just like mopeds and motorcycles. Cyclist should be required to get a license, register and have insurance to ride on our busy streets. A bike can cause over $1,000 damage to a car if they make contact. Also, too many bikes have improper lighting and reflectors for night riding w/riders wearing black, making them impossible to see. We must ALL take responsibility for safety to make our streets great and safe.